As predicted earlier, the World Meteorological Organization (WMO), in its latest press release, re-confirmed that the global land and ocean temperature for 2017 will likely to be among the three warmest years on record. Year 2017 is expected to be the warmest, if we compare it with other years without El Niño warming. The WMO observed that first 11 months of this year were the third warmest on record, behind 2016 and 2015. Much-warmer-than-average conditions are engulfing much of the world's land and ocean surfaces, according to the US National Oceanic and Atmospheric Administration (NOAA). Long-term indicators of climate change such as increasing carbon dioxide concentrations, sea level rise and ocean acidification continue unabated. Arctic sea ice coverage remains below average and previously stable Antarctic sea ice extent was at or near a record low. Analysis done by the NASA’s Goddard Institute for Space Studies (GISS) and the European Centre for Medium Range Weather Forecasts (ECMWF) Copernicus Climate Change Service found that the past meteorological year (December 2016 to November 2017) is the second warmest on record. “What is more important than the ranking of an individual year is the overall, long-term trend of warming since the late 1970s, and especially this century,” said Omar Baddour, senior scientist at the WMO. “Along with rising temperatures, we are seeing more extreme weather with huge socio-economic impacts,” he said. The WMO will combine datasets from the NOAA, NASA GISS, and the Met Office Hadley Centre and Climatic Research Unit (UK) for a consolidated temperature ranking for 2017. 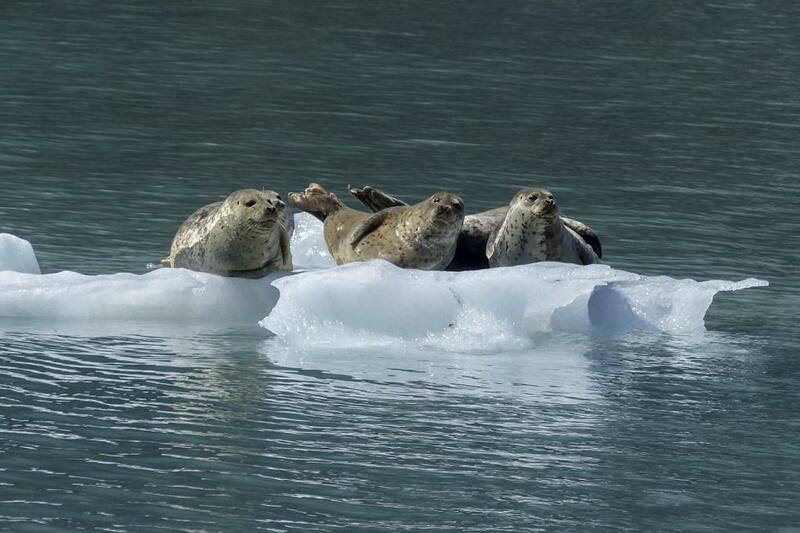 Different datasets show different results because of the way they represent relatively warm conditions that have predominated over the Arctic and the Antarctic. 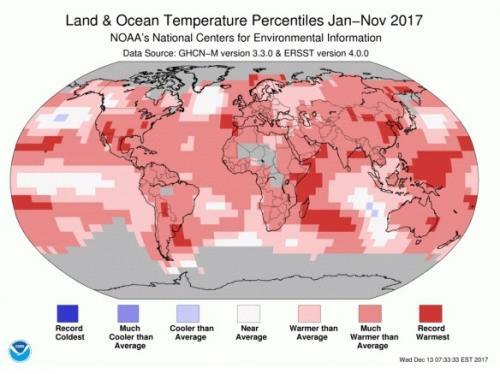 While the NOAA said this November was the fifth warmest on record, NASA and ECMWF Copernicus Climate Change Service said it was the third warmest. Arctic Report Card, a peer-reviewed study that brings together the work of 85 scientists from 12 nations, was released this month by the NOAA. Now in its 12th year, this report card revealed that Arctic shows no sign of returning to reliably frozen region of recent past decades. Despite relatively cool summer temperatures, observations in 2017 continue to indicate that the Arctic environmental system has reached a 'new normal', characterised by long-term losses in the extent and thickness of sea ice cover, the extent and duration of the winter snow cover and the mass of ice in the Greenland Ice Sheet and Arctic glaciers, and warming sea surface and permafrost temperatures. In 2017, the Arctic continued to warm at double the rate of the global temperature increase, resulting in the second warmest air temperatures, above average ocean temperatures, loss of sea ice, and a range of human, ocean and ecosystem effects, according to the WMO. “While 2017 saw fewer records shattered than in 2016, the Arctic shows no sign of returning to the reliably frozen region it was decades ago,” said the Arctic Report Card. The average surface air temperature for the year ending September 2017 is the 2nd warmest since 1900. However, cooler spring and summer temperatures contributed to a rebound in snow cover in the Eurasian Arctic, slower summer sea ice loss, and below-average melt extent for the Greenland ice sheet. The sea ice cover continues to be relatively young and thin with older, thicker ice comprising only 21 per cent of the ice cover in 2017 compared to 45 per cent in 1985. In August 2017, sea surface temperatures in the Barents and Chukchi sea were up to 4° C warmer than average, contributing to a delay in the autumn freeze-up in these regions. Pronounced increases in ocean primary productivity at the base of the marine food web were observed in the Barents and Eurasian Arctic seas from 2003 to 2017. Arctic summer low ice: The lowest so far is 2012 (2007) and it recovered in 2013. Still then the ice cover is fluctuating between 2012 and 2013 levels.